For automotive and machining applications, a tool called a dial caliper is frequently used as a reliable precision tool that is relatively easy to operate. It is capable of measuring parts to the thousandth. And though it is, as just stated, more or less easy to use, it is important that a dial caliper be used correctly and read accurately. Keeping in mind that it is far easier to show someone how to use a dial caliper than it is to simply write it on a piece of paper and read it, not to mention far more beneficial for both parties, here is a guide on how to use a dial caliper. Close the caliber. Look through the jaws. If you can see no light, the caliber is completely closed. The caliper will need to be thoroughly cleaned if you can see the light through the jaws when it is closed. Or a little filing may need to be done because there is a metal burr getting in the way. Make sure the clamp is closed. Now the bezel nut must be loosened. Once it is loose, twist the outside of the dial so that the dial’s needle is directly over zero. Now snug up the bezel nut. Special Note! Be absolutely sure that the part you are measuring has been thoroughly cleaned because any debris can greatly affect the precision of the measurement. Depending upon the type of part that is being measured, you will either use the outside or the inside of the jaw. Width, length, and thickness are measured with the outside of the jaw. Holes and gaps are measured with the inside of the jaw. To measure a part (we will use the outside of the jaw as we would when measuring width, length, or thickness) you will first open the jaw. Place the part in the jaw. Close the jaw around the part making sure that there is a snug feel. At the same time, however, without complication, the part should be able to slide out and in of the jaw relatively easily. Now tighten the lock screw on the caliper. This holds the position. You must familiarize yourself with what the marks on the dial mean before you can accurately determine a measurement. Because every 10 marks is equal to (2.5 cm) 1 inch, every mark would then equal .1 or 1/10 inch. The number upon which the needle rests, on the dial indicator, must be expressed in thousandths. What this means is that whichever number you read needs to be multiplied by .001. Example: If the needle is resting on 15 (between 10 and 20) the measurement denoted by the dial is actually 0.015 inch. But this is only part of your measurement. This is where the rest of the measurement comes in. Look to the left of your dial indicator for the straight edge. How many inches has the straight edge gone past? Next, how many tenths has the straight edge gone past? Write both of these down. Example: 1.3 inches. Finally, see on the dial indicator the number that is directly beneath the needle. Multiply that number by .001. Record that number as well. As suggested in the example in step five, we will say that that number ends up being 0.015 inches. Put all of these numbers together. You now have your measurement! The measurement of the part in our example is 1.315 inches. 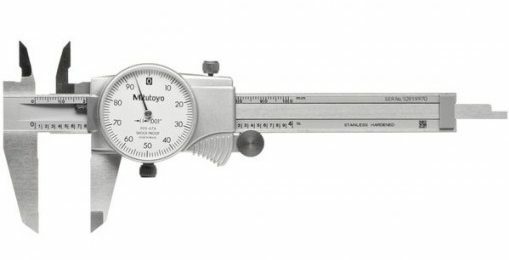 Of course a caliper is only one of the multitudes of measuring tools utilized in the world of the metrology. And, incredibly, there is far more than just one type of caliper as well. A number of makes and models are available, each having their own specific characteristics, model number, series number, etc.